Be part of creating a better future. Change the way you see the world. Join The Resilience Hub & Midcoast Permaculture as they surpass their 20th internationally-recognized Permaculture Design Certificate (PDC) Course. This one-weekend-per-month format is ideal for anyone who would not typically be able to take two weeks off from life/work to take an “immersion” PDC. Please take some time to review all the information about this course on our website before registering! When you’re ready to register, click here. Our summer Maine PDC this year returns to MOFGA’s Common Ground Education Center in Unity, Maine. The expansive campus and spacious buildings make for an ideal learning environment within traveling distance to many field trip sites. Before you register, make sure you check our Sliding Scale Tiered Pricing structure for the PDC Tuition. Based on your household size and income, you will either be TIER #1, #2 or #3 which affects the total price you will pay for the PDC. 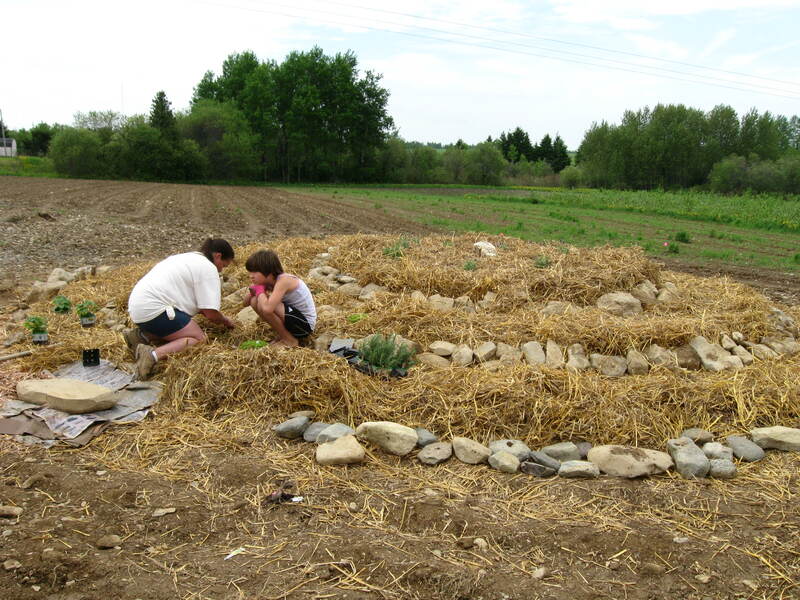 The Resilience Hub is one of the most experienced permaculture design and education groups in the Northeast US, though there are many other great ones! We strive to achieve very high quality in our programs and are committed to continuous improvement. Course Logistics – Schedule & Flow, Food & Hospitality, Accommodation, Transportation, etc. Enrollment & Registration Details – Course Costs, Sliding Scale, Work Study & Discounts, Attendance Policy, etc. Our courses typically sell out so make sure you register and make a deposit to hold your space. 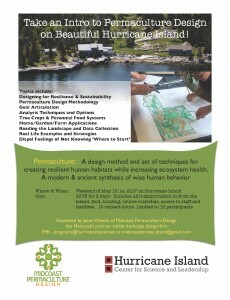 Check out the details for this upcoming 12 hour Intro to Permaculture course on Hurricane Island! We will engage the eyes, ears and hands in this dynamic course to give participants and in-depth introduction to permaculture design and how to apply it to garden and small farm design. 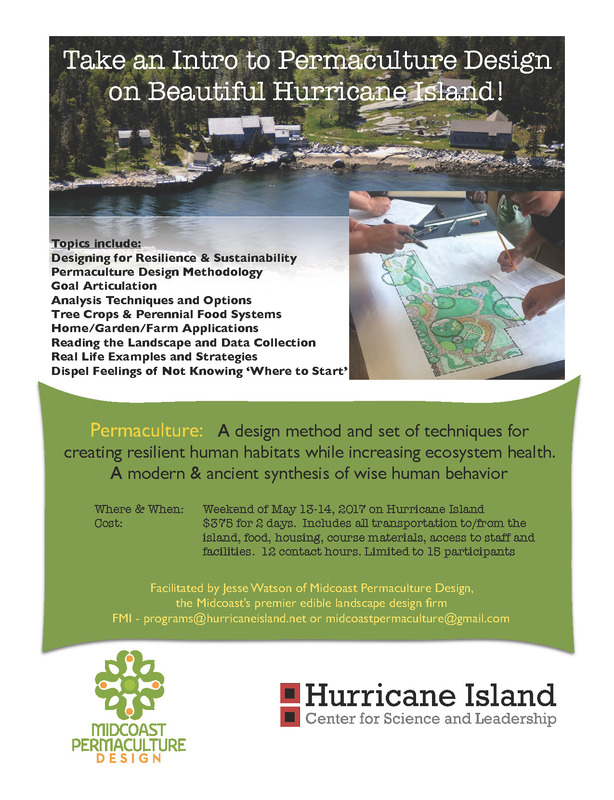 We are bringing permaculture to island communities by teaming up with Hurricane Island Foundation and bringing it to that island. We will live in an off-grid community while studying the design of resilient biological and technical systems. Help spread the word and register today! As we pour over seed catalogs huddled next to the stove, now is a good time to begin dreaming and scheming for our gardens this coming year. 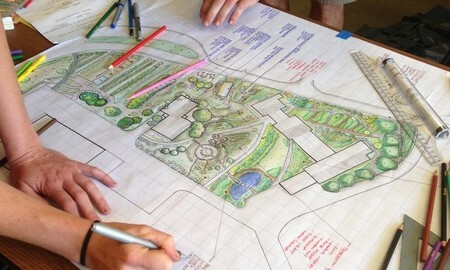 And the best way to begin the garden is with good design. The way to do that is to first consider the goals for the year and any adjustments you might make to design and management. Of course, sustainability and resilience is on everyone’s mind these days, and permaculture offers a unique approach to design to achieve just that. With that, here are a number of permaculture related events of interest. Some are here in the Midcoast and some are elsewhere. Some are free and some have fees. Take a look, tell us what you think, and keep in touch! Food Sovereignty vote in Rockland January 9 6p. 6-6:15 is reserved for public comments (limited to 5 minutes each) so you can come and voice your support. Boston winter PDC (one weekend a month, starts Jan 14-15). $250 deposit to hold your spot. We have space for 1-2 more people so tell your Boston friends to act quick and register before this course sells out! Introduction to Permaculture lecture series. Camden adult ed. 4 week course starts Jan 25, $35. Hurricane island Intro Course May 13-14. More details soon. Here are some testimonials from our past courses. Spring has come early this year even as winter threatens to dust us with snow periodically. The birds are singing, the coltsfoot and crocus are blooming, and we are seeing emergence everywhere. Spring is a good time for people to consider their goals for the year and how they might make adjustments to design and management. Spring is a great time to consider, for example, how to manage the water flowing across your landscape and how to design plant systems to make advantageous use of that water. 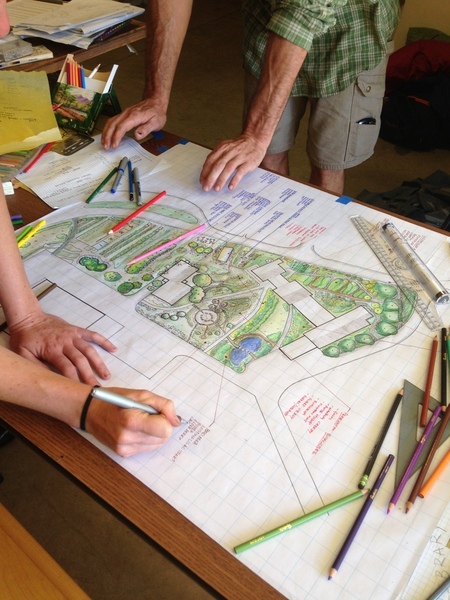 If you’ve been wondering about how permaculture might be able to help with your landscape’s design challenge, now is the perfect time of year to contact us for consultations and design projects! With that, here are a number of permaculture related events of interest. Some are here in the Midcoast and some are elsewhere (Unity, Portland, NY). Some are free and some have fees. Take a look, tell us what you think, and keep in touch! Wednesday, April 13, 6:30, Waldoboro public library. Perennial Polyculture Design presentation. Thursday, May 5, 6:00, Thomaston public library. Perennial Polyculture Design. Techniques for Multi-Stakeholder Permaculture Projects. Thursday, April 7, 2016. 9:30 AM to 3:30 PM. Resilience Hub, Portland. Price $39. Webinar: Successful Permaculture Event Design & Hosting. Saturday, April 16, 2016. 9:30 am – 4:00 pm. Free, registration required. While not a permaculture course per se, this workshop clearly demonstrates the permaculture ethic of PeopleCare. This workshop is designed for non-Native people. It provides an opportunity to reflect on our shared history and future with Native people. It includes: a very brief history of US government relationships with Native people; awareness of white privilege; and ally responsibilities. Space is limited and registration is required, so please register by emailing Barbara@mainewabanakireach.org or calling 951-4874. Questions are welcome. Saturday, May 7, 2016 10:00 AM to 12:00 PM. Resilience Hub, Portland. Space may be limited so please take your RSVP seriously. Starts the weekend of June 3, 2016. Hosted at MOFGA in Unity. $250 deposit to hold your spot. Space is limited. Typically sells out. …and while this course is far afield, we will be there and we have a healthy Maine contingent organizing a caravan. This is a 10-day intensive on the Regrarians farm-scale land management design platform. This is a professional development training geared for farmers, landscape designers, and land management professionals. This article was originally printed in Permaculture Design Magazine (formerly Permaculture Activist) issue #98, Winter 2015. Thanks to everyone who contributed to this issue. This article is meant as a primer on decolonization in a contemporary North American context, written specifically for permaculture designers, teachers, activists and gardeners. It is offered so that we may think critically and philosophically about “sustainability” and our role in our culture as designers of novel ecosystems. In this article we will seek to answer the following questions: of What is decolonization? Why should permaculture designers care? What is my experience with this topic? We will attempt to make a clear critique of settler colonialism here in industrialized North America, and demonstrate how we can simultaneously be both victims and perpetuators of settler colonialism. As a bridge to the challenge of bringing a decolonization framework into permaculture practice and pedagogy, I would like to start by mapping those same questions onto permaculture itself. As a quick thumbnail sketch, permaculture is an ecological approach to the design of whole systems. It is an ethically bounded framework of ecological design that can be used to design everything from landscapes and farms to business enterprises and other cultural projects, on nearly any scale. On the surface, permaculture is often about designing eco-groovy, perennially edible landscapes, gardens and farms. On a deeper level, permaculture is about the conscious design of ecological cultures. 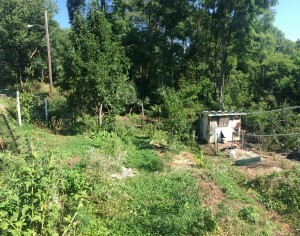 As a design process, permaculture can be used to design both outer and inner landscapes, using observation as the preeminent tool for understanding. We would do well to reflect on our role as ecosystem designers and designers of ecological culture, and to think of ourselves in our design and organizing work as “culture jammers.”[i] What then, are some responsibilities here (vis a vis EarthCare, PeopleCare, FutureCare)? How we behave and interact with our ecosystems matters. The reason this matters is because the industrial systems we are embedded within and dependent upon are often deeply flawed and corrupt, in addition to being quite brittle. Whether we turn our observational gaze to food systems, energy systems or economic and political systems, they are all overdue for a radical ecological revision. The interactions between climate change, energy peak and economic contraction mean that the stakes are very high. Whether considering energy systems of production and distribution or agricultural systems of production and distribution, when we examine them critically we can see that these systems are brittle and capable of breakdowns at many pinch points. And it isn’t even accurate to say merely that the economic-political system is flawed, because it seems more accurate to say that it is deeply corrupt. Or perhaps it’s designed to function exactly as its functioning now: to keep the poor and disenfranchised firmly separated from the elites, and to maintain this oppressive distribution of power. Permaculture is a process of understanding, analyzing and designing systems. By using this lens of understanding, you can look at these systems and choose your leverage points. If you have access to land use, permaculture allows you to design perennial systems of regenerative food production that are much more resilient than annual-based agricultural systems of food production. Permaculture allows us to design productive loops of synergies between our technologically built environments and the surrounding ecologies within which we live. Think of it as regenerative design that heals and repairs ecosystems while at the same time producing beneficial yields. Through this process of the design and management of ecosystems, we can regenerate ecological health by weaving patterns of beneficial relationships in ecosystems. Permaculture gives us the ability to design resilient homesteads, farms, villages, towns and economies so that we have the ability to weather the storms that come our way, whether they are economic or ecological in nature. More importantly, though, permaculture gives us the ability to heal and regenerate ecosystems through “right relationship” to all the other beings around us: plants, animals (including humans), wind, water, rocks, soils and so on. I am a permaculture designer, gardener, activist and teacher. The body-mind this go-around happens to be in the form of a cis-male of northern European ancestry (from the British Isles and Scandinavia). My ancestors came from cool temperate and cold northern climates. My family and I currently reside in occupied Penobscot territory, known as Midcoast Maine in the industrial nation-state known today as the United States (and this too, shall pass). I come from a background of union activism, art & philosophy, direct-action environmentalism, public school education, and building trades. I’m living out a version of the “American Dream” with an eco-groovy veneer here on my one-acre permaculture demonstration site where we manage small scale agroforestry systems with poultry as integrated livestock. My lineage of permaculture teachers includes Charles & Julia Yelton and Lisa Fernandes of the Resilience Hub. My lineage of earth skills teachers includes Mike Douglas and Mal Stevens of the Maine Primitive Skills School. 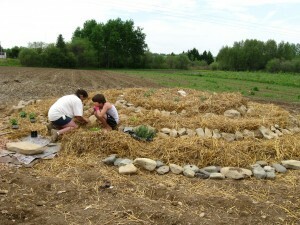 I maintain a permaculture design/build practice for residential and farm clients. 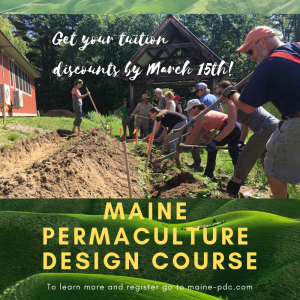 I help to facilitate and teach Permaculture Design Certification courses (PDCs) here in Maine and sometimes in Boston, partnering with the Resilience Hub. I serve the larger Northeast regional network by being an active participant on the board of PINE, the Permaculture Institute of the Northeast. My economic forms of production include designing, teaching, gardening and construction trades (carpentry, painting). I am here to learn how to be of better service to all people. I’m here to help make the world a more just and sustainable place for my daughter and all the other children in the world, those alive today as well as those of future generations. I’m here to learn how to be a good ancestor. I’m also here because I dream of a world free of the industrial nation-state. I see an agenda of decolonization coupled with land use based on permaculture design as a positive way forward toward a time of greater ecological and social health, in which we may rediscover how to live in right relationship to a place while simultaneously repairing and healing historic crimes against humanity. I became aware of the topic of decolonization a year ago. It was a topic whose initial catalyst came from Rafter Sass Ferguson’s article, ”Critical Questions, Early Answers,” which is an overview of the permaculture movement. [ii] In this article he interprets the racial homogeneity of the permaculture movement as a vulnerability. He suggests that the response to this weakness should not be one of recruitment or tokenism, but rather requires some deeper reflection on how we can be relevant to communities of color. While it’s a challenge, it’s also a tremendous opportunity. It’s also important to remember that no group of people is monolithic, whether we are talking about the permaculture movement, people of color, or Native American peoples. How can we expect to design a regenerative legacy for our descendants if we haven’t yet made peace with the ancestors? In a literal and legal sense, decolonization “brings about the repatriation of Indigenous land and life.”[iv] It is important to note here that Native American peoples are not mythical relics of the precolonial or pre-Columbian Americas. They are not extinct. Native people continue to live and many continue to tend their council fires, which have been maintained for hundreds of continuous years. Many of them continue to resist the process of settler colonization and assimilation. Decolonization is about upholding longstanding treaties, adherence to international law, and the return of genuine sovereignty and the administration of land use to First Nations peoples. Decolonization is about correcting past crimes committed by (mostly) European settlers by returning “stolen” land. [v] Ideally this process should be done without strings attached. Questions of what happens to present settler peoples is secondary to the act of returning Native land to Native peoples. It is this facet of decolonization which strikes fear into the hearts of most settler peoples because it offers no firm guarantee of a settler futurity. In an ideal process here in North America, determining the future of settler people would be a separate process of negotiation between the newly repatriated indigenous governance structure and the settler peoples. This concept is complicated by the fact that the ancestors of some settlers of color have been brought here against their will, in the slave trade or as indentured servants. This is known as the “tangled triad” of settler—native—settler of color. [vi] And while settlers of color may experience systematic oppression at the hands of the currently designed economic-political system, they are also settler people and not members of the First Nations. And because of this they have a stake in the continuity of the colonial project. 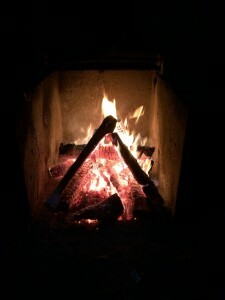 How can we tend our own council fires in service to the community? How can we expect to be designers of ecological culture if we don’t have a clear understanding of our past? How can we expect to design a regenerative legacy for our descendants if we haven’t yet made peace with the ancestors? If permaculture has as its ethical foundation Earth Care, People Care and Fair Share or Future Care, what do those words mean in this light, given the fact that people like me passively benefit from systematic forms of oppression and genocide that continue today? In Edible Forest Gardens, Dave Jacke talked about the generative or degenerative potential that disturbance plays in ecosystem dynamics. As a principle for ecosystem design and care he talked about “shifting the burden to the intervenor.”[vii] So that when we decide to fall trees or sheet mulch so that we can plant forest gardens, the responsibility of managing the consequences of that disturbance falls to the gardener who intervened. I consider this principle when recognizing how I passively benefit from the actions that my ancestors probably took to help construct this oppressive and exploitative system. It informs how I think about what part I can play to heal historical traumas. If “responsibility falls to the intervenor,” how does that affect contemporary land ownership for those who can afford it? How should this principle inform the actions of ethical people who benefit from skin and gender privilege in general? I don’t have any firm answers, but I know that asking these difficult questions causes an uneasy and unsettling feeling. It seems the observation of the tension in considering these questions of land ownership/stewardship in light of this historical and contemporary inheritance is important. If we genuinely care about the regeneration of ecosystems and culture, we should talk more openly about this tension of “owning” “stolen” land,[viii] especially when seeking relationships with contemporary Native peoples. In another sense, a cultural sense, decolonization is about the process of removing colonizing thoughts from your own mind and colonizing behavior from your own lifeway. In this sense, there is broad overlap between movements for social justice and anti-racism. For me, it is a process of learning how I passively benefit from my racial and gender privilege. It is a process of unlearning racist and white supremacist ideas and behaviors, some of which I wasn’t consciously aware were in my head. For me, it is a process of working through my grief over the crimes my ancestors may very well have committed. It is about learning what it means to be an ally, how to listen (especially when what I hear is emotionally challenging), and learning to give thanks always.We have to decolonize our minds before we can decolonize Native North America. We have to remove the empire from our heads before we can remove the empire from any land base. Decolonization matters because of mountaintop removal, water mining and fracking. If resource extraction or industrial infrastructure needs to happen, none of us are immune to being displaced. If it’s under your house and the machine needs it, it cares not who you are. It will get those resources and eat you along with them, if need be. Think of decolonization as another form of enlightened self-interest. We have to remove the empire from our heads before we can remove the empire from any land base. Decolonization matters because it is the right thing to do in a moral sense. It gives the ethic of ‘People Care’ teeth. Ferguson points out that the mostly homogenous demographic makeup of the permaculture movement is a weakness. Recruitment is disingenuous. We need to be relevant. Decolonization allows for a framework of relevance as long as we have the courage to heal our “White Fragility”[ix] and face the realities of a white supremacist economic-political system. And if we have privilege and agency within that unjust and atrocious system, we must commit to using that access to dismantle that system. I submit that the framework of decolonization would also save permaculture from being one more happy-faced, green, eco-groovy front for the project of genocide. This framework would help us discern between solidarity projects and green-missionary projects, both here and abroad. This lack of discernment is a blind spot. What good does it do to impose a forest garden somewhere if it isn’t a good cultural fit, or if the design process isn’t sufficiently inclusive? Such a project is nothing more than another form of imposition upon the locals by another foreign interest. Permaculture allows us to remember how to be in right relationship to place. Some open questions I still have revolve around issues of permaculture and its relationship to colonization. To what extent is permaculture a product of a settler people? Permaculture certainly appears to have been assembled from toolkits from all over the world and throughout history. And while that seems “progressive” or “cosmopolitan,” are there instances where design principles or techniques associated with permaculture were misappropriated from indigenous peoples without their permission? To what extent is permaculture practiced as a form of “green missionary work” throughout the world? While I get excited about the National Agroforestry Center looking into ‘Traditional Ecological Knowledge’ (TEK) with the interest of transitioning tillage-based agriculture to perennial agricultural systems, I can’t help but notice the potential for inadvertent colonial appropriation. [x] In this case, settler peoples are studying and applying indigenous forms of land management, which can be positive as long as the tools and techniques are willingly shared by the indigenous peoples and not brashly stolen, like they have been so many other times throughout history. Clearly we’re doing important work with permaculture, so I want to separate the baby from the bathwater. This critique is offered to make the evolution of our movement cleaner and more respectful of indigenous cultures, and to find a way to balance “Leaver and Taker”[xi] cultures, maybe even to unify them. Once, during a presentation I said, “Permaculture allows us to remember how to be indigenous to a place.” It was a meme I had seen elsewhere, but I instantly felt skeevy after repeating it and vowed to never say it again. In the sense of some kinds of strict land management and home economics, it’s kind of true. But I realized that saying that sentence, especially to a room full of (mostly) white people, has the effect of erasing the lived experience of contemporary indigenous North American people. The tragedy is that such thinking offers permaculturist white people the opportunity to replace those indigenes and complete the project of settler colonialism, without those permies realizing that they’re doing so. In my work regionally in the Northeast Permaculture network, one proposal that has emerged is that we consciously refrain from self-applying the term ‘indigenous’ if we are not actually indigenous to Native North or South America. So instead of making a statement like “Permaculture allows us to remember how to be indigenous to place,” we should choose other language. 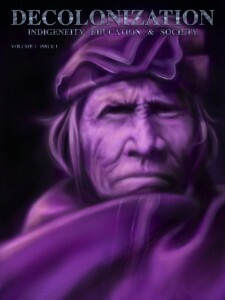 The reason for this relates to a concept in the article “Decolonization is not a metaphor,” which the authors call “settler moves to innocence.” A move to innocence is a diversionary attempt by a settler person to absolve themself of the guilt of living on stolen land using some form of catharsis, without actually addressing the difficult societal structures involved. So saying something like “Permaculture allows us to remember how to be indigenous to a place” makes a metaphor of indigeneity and thereby erases the lived experience of real peoples who are actually indigenous to Native America and who still resist the campaigns of genocide and expropriation of land and resources that continue to this day. Instead we can deploy an alternate sentence, such as “Permaculture allows us to remember how to be in right relationship to place.” This phrase contains a subtle but profound difference, one that relinquishes the settler colonial replacement strategy. Another proposal is that we should seek genuine and longstanding relationships with existing First Nations. We should ask how we can be relevant to their lives, and ask for permission and endorsement of our activities and events. We should listen with humility when we are challenged over our privilege or unexamined racism. We need to be aware of white fragility if we start feeling defensive during racially charged conversations. We need to give thanks always. During events like the regional Convergence, we might make an offering at the beginning to acknowledge who the indigenous peoples are who live/d on the land we are now occupying. And when we publicly use ceremonies or songs from other cultures, we must be absolutely clear exactly how we got permission to use those ceremonies or songs. And finally, what does the decolonization of Native North America look like? How do we organize for that kind of vision or dream? How do we incorporate righting this egregious, unresolved, and ongoing historical crime into our culture jamming work? How do you organize and convince White, Black and Yellow people into giving their land back to the Red Nations from which all this land was stolen? As designers of “bioculturally diverse ecosystems,”[xiv] how can we accomplish our goals of cultural, ecological and economic sustainability without contributing to the erasure of indigenous people and their lived experiences? These are a few thoughts I’m left with. I don’t have any answers, but I do care deeply about being a good neighbor and a good ancestor to my descendants. I am deeply grateful for the space to explore this important topic in these pages, and I am grateful to the other participants in this conversation for their help in unpacking these ideas and figuring out how to apply them to our permaculture organizing efforts. Onward to regeneration of healthy systems! Special thanks to my dear friend Kiarna Boyd for holding me accountable to a high standard and compassionately aiding my evolution in this area. Special thanks also to gkisedtanamoogk (Wampanoag nation), Canupa Gluha Mani (Lakota nation), and Ana Oian Amets (Aquitainian proto-Basque ancestral recovery) for the same. Jesse Watson is a permaculture designer, teacher and builder living and working in Midcoast Maine, occupied Penobscot territory. He operates Midcoast Permaculture Design (midcoastpermaculture.com), serving residential and farm clients. He helps facilitate PDCs with Lisa Fernandes of The Resilience Hub. Jesse helped organize the Northeast Permaculture Convergence as the principal logistics coordinator in 2010 and 2014. He now serves as president of the board of PINE, the Permaculture Institute of the Northeast. [vi] Tuck and Yang, 2012. [vii] Dave Jacke with Eric Toensmeier, Edible Forest Gardens, Volume 1, pg 20 (Chelsea Green, 2005). [xi] Daniel Quinn, Ishmael (Bantam/Turner, 1992) and Beyond Civilization (Harmony, 1999). The shorthand is that “Takers” are people of industrialized growth-based societies and “Leavers” are people of tribal, small-scale, village-based or nomadic societies. [xiii] Here are some more difficult questions: How is misappropriation different from the meme-swapping that happens when cultures naturally interact? To what spheres of human culture does misappropriation apply? How is cultural appropriation viewed from these different perspectives: culinary, linguistic, economic, technological, ethnobotanical, ceremonial, and magical? Which are tolerated, and which aren’t? How is the answer complicated when a colonial culture is dysfunctional in terms of its ethics, morals, worldview, meaning, and community values? If we want to remember a spiritual or mythic relationship to land base and ecosystems, how can reconstructionist and syncretic spiritual movements happen in a context that is fearful of misappropriation? How can we ask our ancestors for guidance?